Wow. This quest was a fruitless ambition. Hello, it's me again. This quest is long dead. A while ago, I had started this quest with a new progression idea in mind. Of course, with my limited interest, I fell off of it soon after completing the 2nd dungeon. 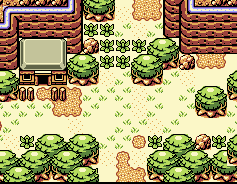 If I ever start another quest, it'll be an easy one, not one that requires so much work, such as a custom overworld. What if I made a remaster of the first qu... oh wait, I already did that, I lost interest in THAT too. I guess what I'm trying to say is that I have a terrible span of attention and focus, so I am gonna work on that before I work on any more quests. Not that I was ever good at it, and it's not like I am important enough for anyone to care. I mean I have not submitted ANYTHING to this forum so I understand. Welp, after something like 5 years in ZQuest, I still have not completed a single thing. Ah short attention span, I love you. Oh don't worry. There's several people with the same issue. If you enjoy working on projects thats at least some win for you and you always learn stuff. I would recommend making something really small. Like something that takes only a week to make. That way, It can be a goal for that week and after that week your done! Scope small enough to get it finished before you burn out, and give yourself a deadline! The latter is very important as it acts as motivation to actually work. For example, I wanted to get Linked Seasons done before the expo, so in the month or two leading up to it I was working several hours a day on it, and really enjoying myself! Since then progress on the set has all but stagnated since I never set a deadline to get the next version done by. Anyways, yeah, give yourself something small to start with, don't be getting overly ambitious, as that's when interest dies out, and you're left with 5 unfinished quests. Make the quest for yourself, and not anyone else. Making the quest is entertainment in itself, and someone else enjoying a playthrough of it is just icing on the cake. I've been working on The Ring of Time for what? 7 years now. And I scarcely have 2 areas done. I also have LR4 that I haven't touched since 2011. So, it happens to the best of us man. Nobody will look at you any differently. That's perfectly fine! I didn't release my first quest until last year and even then it's a pretty short one, not that short is bad. And speaking of short, as others said, maybe try to aim smaller. Bigger isn't always better and you can deliver an amazing experience whatever the size and ambition. Just put your enjoyment and passion into the project and if it fails, who cares? Just know you don't owe the community anything and it's all in good fun. Edited by Matthew, 14 September 2018 - 01:27 PM. Don't sweat it. You are surrounded by alike, I assure you. Edited by Old-Skool, 14 September 2018 - 02:46 PM. As others have said, it's not a big deal. I've been here for over a decade and haven't finished a full, real quest. So I kinda forgot that updates go on the front page as well... I didn't mean for so many people to see this post. Thanks anyway guys! I just kinda feel bad for the people that I asked scripts for, since I can't make anything good with them. I also kinda lost this quest's file, so I do have to start on another one... so for all the people who played this demo... thank you. Im not depressed. Just really. Really lazy. Edited by Aefre, 16 September 2018 - 04:09 AM.